I have recently had a requirement whereby I needed to allow multiple vlans on a single cisco switch port (as I was running out of available switch ports) because of a business need. Our current Cisco environment was only setup to allow one vlan per switch port as it’s configured for “switchport access vlan” instead of trunking. Note: – Before making any changes make sure you have the relevant underlining vlan’s setup on your Cisco switches. Basically I needed to have an uplink in ESXi allow multiple vlans and have multiple port groups each with a different vlan id. So how did I achieve this!! First you need to get your networking team to modify the relevant switch ports (or if you’re lucky enough you will be the individual doing both as it was in my case ) with the new configuration. You may experience a small amount of downtime whilst you reconfigure the switch ports. Once modified then use the vSphere client and connect to the ESXi server(s), go into the “Configuration” tab and select “Networking”. Create multiple port groups on your vSwitch and then assign the relevant vlan id to each port group based on your requirement. 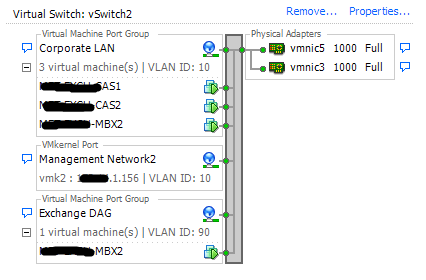 As you can see from the above diagram I have a port group named “Corporate LAN” (used for virtual server communication) and “Management Network2” (used as a redundant management network for vCenter communications) again using vlan id 10 and finally “Exchange DAG” (used for Exchange database replication) using vlan id 90. Now I’m using one switch port supporting multiple vlans instead of creating a new vSwitch with uplinks and using up more cisco ports. One thing to keep an eye on is network utilisation and if need be use traffic shaping to limit the bandwidth used.